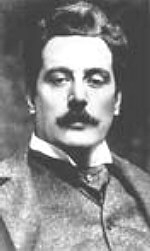 During his lifetime, Giacomo Puccini was the most celebrated opera composer in the world, and became one of the greatest exponents of operatic realism ("verismo"). His major works endure and are performed as standards of the opera repertoire, including La Bohème (1896), Tosca (1900), Madama Butterfly (1904), and Turandot. He also wrote orchestral pieces, sacred music, chamber music, and songs. Giacomo Puccini is currently considered a "single author." If one or more works are by a distinct, homonymous authors, go ahead and split the author. Giacomo Puccini is composed of 11 names. You can examine and separate out names.